Pool Lights - Rintoul's Leisurescapes - Above Ground, Inground Pool and Landscape ideas for Owen Sound, Port Elgin and surrounding areas. Create an entirely different atmosphere in your backyard at night by outfitting your pool with underwater lighting. There are many different options and colours to choose from. Extend the enjoyment of your pool into the twilight hours. JandyWhite incandescent lights bring the brilliance of light to every corner of your pool and spa, casting their light far and wide. 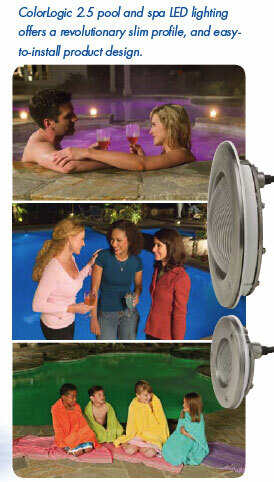 Illuminate your pool and spa for an evening swim, backyard entertainment and added safety. JandyColors quartz halogen lights add a dazzling array of color to your evenings with digitally controlled color changing light. Chose a favorite color from ten blended colors or automatically cycle through all colors for an evening long light show. Jandy ProNiche pool and spa light niches are the perfect partner for all Jandy lights. Engineered to merge perfectly, make installation simple and last for years. Jandy ProNiches are ideally suited for all your pool and spa lighting needs. Hayward™ ColorLogic LED color-changing system provides the choice of five fixed colors and seven dazzling color-changing shows; a lighting solution you will enjoy for many years. So forget about lighting as you know it. Hayward gives you the powerful options to improve and create a magical outdoor environment, for a peaceful atmosphere, or a party mood with an extensive selection of colors for both pools and spas.